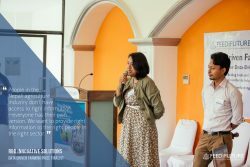 SOLUTION: Agri Nepal – addressing the challenges faced by farming communities in Nepal through digital innovation. Agri Nepal is a android based mobile application which aims to address the core challenges faced by agriculture stakeholders in Nepal. The application basically works with informative, interactive and predictive features which can be operated online and offline too. The features and services designed in the application helps farmers from selection of appropriate crops/seeds to management of crops as well as market linkage services on location basis with financial record keeping and report generation services. In overall the platform helps farmers to enhance their knowledge, skills, competitiveness and even acts as a catalyst to link them with other value chain players too in order to build an inter connected sustainable agri entrepreneurial venture.